Last week the government threatened to remove the Prime Minister from Jan Lokpal jurisdiction, and talks broke down. But then we sent 30,000 messages in a week, and they agreed to his conditional inclusion! Now we have to make sure MPs, Judges, Civil Servants, CBI and CVC are all under the bill. Our voices are being heard — Government officials just told us that they are collating all of our messages and bringing them to the drafting committee meeting on June 15th. 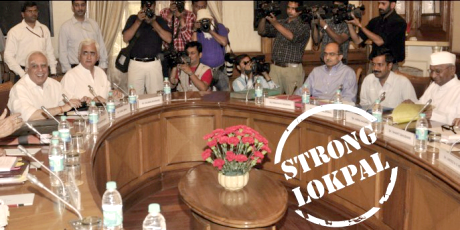 If we can ramp up the number of messages calling for a strong Lokpal now — we could overwhelm the meeting and force the government to bend. Send your messageLast week the government tried to utterly weaken Jan Lokpal by calling to remove its authority over the Prime Minister, Judiciary, and all sitting Members of Parliament. They have already used dirty tactics to stall the process, and we knew those in power would try to stop the inclusion of high level officials — it is a threat to those who are used to 42 years of impunity. But the government also knows that the whole of India is watching and that this is the people’s Bill. Last week we flooded them with messages and showed them that we all know this is a unique opportunity to fight corruption across the board, and we will not settle for anything less than a bill that includes everyone. Let’s together send an avalanche of urgent messages to the Jan Lokpal drafters to save the bill. Click below to send a message directly to the inboxes of the Ministers drafting the Lokpal, Prime Minister Singh, and key Lokpal supporter Sonia Gandhi! Then send this on to every friend or family member who cares about the future of India! People power launched the Lokpal, and our national movement has catapulted it from the annals of history to a fast-tracked drafting committee. But a strong Lokpal is a radical challenge to the status quo. And it is going to take all of us, week by week to stand up together and block every attempt to break or water it down. Let’s stay strong now, while our pressure is urgently needed, and get the law that all Indians want.